The TSL1401 Linescan Imaging board provides one-dimensional sight to almost any microcontroller. Compatible with any microcontroller. It is a platform suitable not only for evaluating TSL1401R imaging chip, but also for incorporation into OEM products, as well as hobbyist, robotic, and educational platforms. 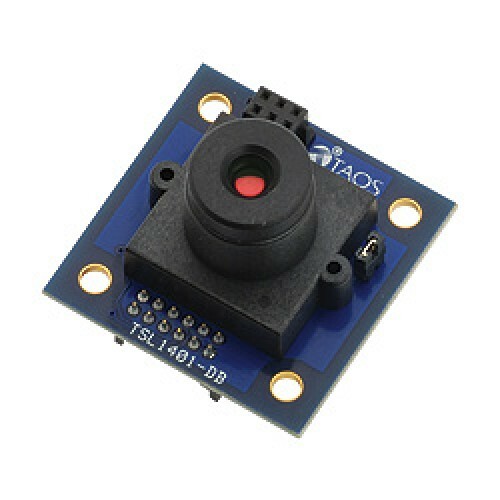 The board includes the TAOS TSL1401R 128-pixel sensor chip, a 7.9mm focal length imaging lens, and control electronics to aid in capturing images for evaluation. It produces a clocked analog data output, whose voltage levels correspond to the light intensity at each pixel. By means of an analog-to-digital converter (or even a simple digital logic threshold), image data are easily transferred to a microcontroller to detect objects, edges, gaps, holes, liquid levels, textures, emissive sources, simple barcodes, and other visible features. Combining it with microcontoller and a suitable output device, one can construct a complete inspection system in a very compact form factor. As an aid to seeing what the camera sees in real time, both for setting up and alignment and for trying various detection strategies, a PC-hosted monitor program provides both an oscilloscope view of the pixels, as well as a sweeping view of multiple scans laid side-by-side. It also includes user-selectable measurement tools for locating edges, counting pixels, computing extrema and averages, and the like.